Tech companies should care more about customers with disabilities. A man using accessible technology. Image courtesy of The Independence Center. It had started as just another call to tech support. Sina Bahram, a Ph.D. student in computer science at North Carolina State University, had been trying to convince the Lenovo customer service representative to send out an on-site repair person to fix the broken audio on his laptop, but the representative was arguing that the company was no longer doing on-site repairs. * Instead, he asked Bahram to go through a troubleshooting procedure, beginning with a visual inspection of the audio port. That presented a problem. “I can’t see it. I’m blind,” Bahram said plainly, which was why getting the audio fixed on his computer was such a priority: It was his connection to the world of written information. Finding himself in the position of having to justify his disability to a person who was intent on questioning its reality, Bahram asked—in terms he admits were rather pointed—that the call be escalated to a manager. But accessible technology is more than just a personal issue for Bahram; it’s his profession. As president of Prime Access Consulting, he helps companies and institutions align their websites and products with principles of inclusive and universal design. He was struck by the contrast: Here he was helping other companies become more accessible, and yet the company that made his computer did not appear to be taking those lessons to heart when training its staff. “Tech companies are becoming more accessible in their product lines, but their social structure is stuck in 1983.” His unpleasant personal experience got Bahram thinking about the lack of a systemic approach to accessibility among technology companies. Some have fully integrated principles of accessible design into their development process, while others still see accessibility as an add on, or even a burden. Take Apple, for instance. It may not be perfect on accessibility issues, but the company has built a text-to-voice screen-reader into just about all of its products. It’s the only mobile device Bahram will use, “and that’s hard for me to say, because I am not really an Apple guy.” When it comes to Amazon’s Kindle line, meanwhile, only the Kindle Fire Tablet and Kindle Keyboard 3G include a built-in screen-reader, and Amazon has repeatedly petitioned the federal government for a waiver on the regulations that require it to make its other Kindle devices accessible. The larger issue here is that some “tech players are slow to recognize the incredible impact accessibility has on their customer base,” Bahram says. When you make a product that’s fully accessible to the blind, you are also making a product accessible to the elderly, to people with temporary vision problems, and even to those who might learn better when they listen to a text read aloud than when reading it themselves. This is the idea of universal design: that accessible design is just better design. The regulations that require Amazon make its Kindles accessible (the Federal Communications Commission’s 21st Century Communications and Video Accessibility Act of 2010) also require that cable box manufacturers make the devices accessible to the blind and visually impaired by this year, says Plotin’s colleague Sean Goggin, technologies manager at the Center for Disability. But “to my knowledge the only one really out there that is championing that is Comcast.” Given Comcast’s less than sterling reputation in the art of customer service, this is saying something about the rest of the field. So what does work? 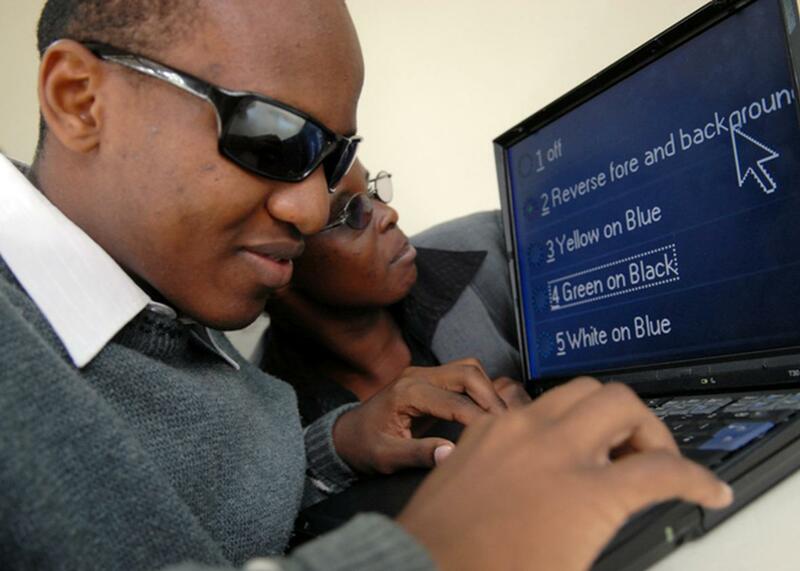 The National Federation of the Blind (and its Center of Excellence in Nonvisual Access) bases its outreach around something that Van Gerven calls “enculturating accessibility.” That means helping companies understand how integrating universal design principles into their company culture produces better results—more accessible products, reaching more customers in more effective ways. But it has to be more than just a change to a product line, Van Gerven says, the sort of shift that alters the way everything runs from the company policies to quality insurance. Despite the depth and persistence of the problems with accessibility in the technology sector, Van Gerven says there has been a lot of improvement, even in just the past year. Increased interest from Web developers has led the National Institute of the Blind to schedule a Web Accessibility Training Day at its Jernigan Institute in Baltimore on Nov. 4, for instance.